From L to R: Matthew West, Steven Curtis Chapman, Plumb, John Sanders (K-LOVE Fan Awards Co-Creator and Producer), Jon Klein (TAPP Co-Founder and CEO), Mike Novak (K-LOVE President and CEO), Francesca Battistelli, David Pierce (K-LOVE CCO) and Colton Dixon. 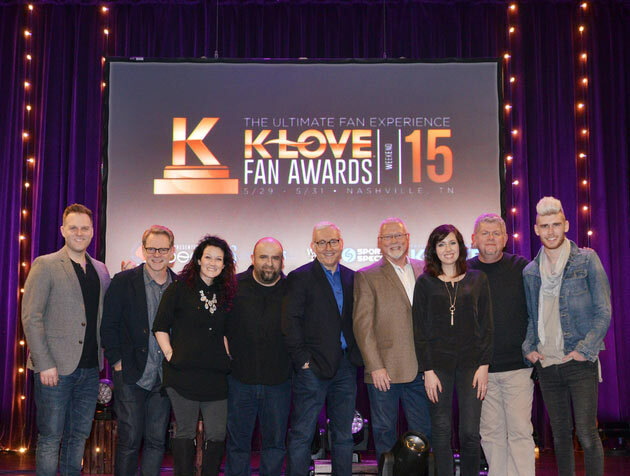 Nashville, Tenn. (January 20, 2015) - At a press conference at The Franklin Theatre outside of Nashville this evening, K-LOVE announced the nominees for the third annual K-LOVE Fan Awards Show to take place on May 31, 2015. K-LOVE - the leading Christian music radio network with a weekly listenership of over 14 million people - will once again bring the only fan-voted award show in Christian music history to the Grand Ole Opry House in Music City. The show will be the pinnacle event of the K-LOVE Fan Awards Weekend and Ultimate Fan Experience, which includes tickets to the Awards show, a three-night stay at Opryland, dinner with the K-LOVE staff and friends, a weekend kick-off concert, a late night event, two breakfasts, encouraging speakers, access to the K-LOVE Fan Zone and more. Among the attendee's for tonight's press conference were K-LOVE President and CEO Mike Novak and K-LOVE CCO David Pierce, as well as host Steven Curtis Chapman, Colton Dixon, Francesca Battistelli, Matt Maher, Matthew West, Plumb, Nashville industry and media executives and, for the first time, fans. "We're excited to provide K-LOVE fans with a gathering place where they can be fully immersed in a community that they love," said Klein. "The artists they'll meet and the stories they'll watch on K-LOVE TV will pull members deeper than ever into the music, message and meaning of the Christian songs and artists they adore. We'll offer premium content and provide subscribers ongoing opportunities to interact with fellow K-LOVE fans and radio personalities." "We are thrilled about K-LOVE TV creating another avenue for fans to connect and go deeper with K-LOVE, their faith and the artists they love," said Mike Novak, K-LOVE President and CEO. The K-LOVE Fan Awards mission is to create a fan experience that celebrates and promotes artists, athletes, authors and entertainers who, with excellence, engage and impact popular culture for Jesus Christ. Previous hosts for the event include Phil & Kay Robertson and Jase & Missy Robertson from A&E TV's popular show "Duck Dynasty," Candace Cameron Bure and Matthew West. For more information on this year's exciting lineup and award show hosts, visit www.KLOVEFanAwards.com. Fans are encouraged to sign up for the exclusive K-LOVE Ultimate Fan Experience, which will begin May 29 and run through May 31. With Nashville's Gaylord Opryland Hotel & Resort as the home base, those who join this Experience will receive tickets to the Awards show, a three-night stay at Opryland, dinner with the K-LOVE staff and friends, a weekend kick-off concert, a late night event, two breakfasts, encouraging speakers and access to the K-LOVE Fan Zone, which will include exclusive meet & greets, autograph signings and much more. There are limited spots to the Ultimate Fan Experience and it is slated to sell out.